Funny promotional banner outside a bar at Patong, popular (notorious) for its nightlife. There are many, many, many bars especially centred on Bangla Road. It was quiet during the day but come night time, it comes to life. 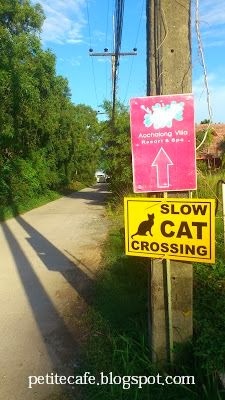 Wild and eye-opener, a walk along the road is a must for first timer to the island. Besides the usual lady boys, pole dancers, people trying to sell tickets for ping pong show, there are also people holding exotic animals such as snake, ready to charge you for photos with the animals! I avoided them as I do not want anything creeping up on me. They can be rather pushy so try to avoid them if you don't fancy getting a photo taken with the animals. It's a very touristy island. Everything is design to cater, attract and appeal to tourist. 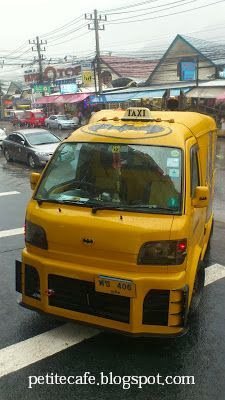 A Bat-Taxi will definitely stand out. Away from the madness of Patong, Chalong Bay is located at the other side of the island. The dirt road leading to the hotel. Didn't see any cat!